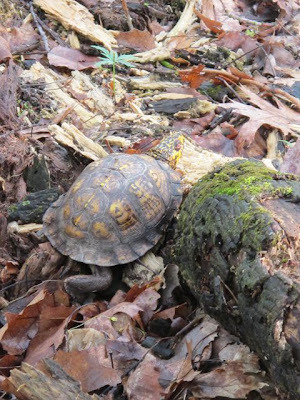 Julie Zickefoose on Blogspot: Morel Hunting: Turtles and Dogs Like It, Too! 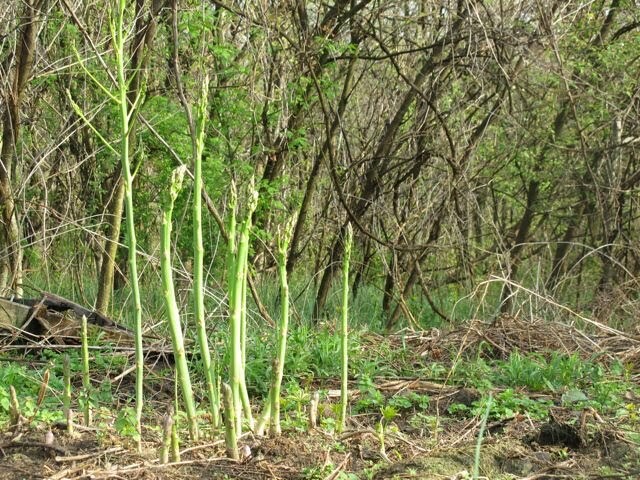 In the exquisite timing of spring, morels come up just as the asparagus is ready for cutting--the last week of April. This patch has been growing for 19 years and we have more than a dozen big feeds off it each spring. It gives and gives and demands little but good mulching. Last summer I used endless stacks of newspapers, topped and layered with fresh grass clippings. The clippings, raked off the lawn, held the newspapers from blowing away and disguised them from view. Quite a lovely system! It all melted into the soil, and the spears were a snap to find this spring. 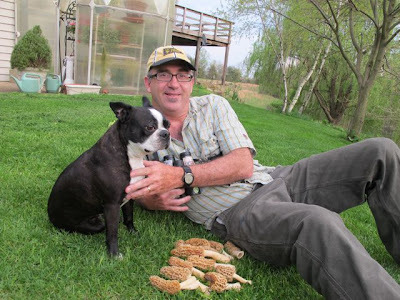 Of course the chirren aren't the only people who love hunting morels. Chet Baker comes along. He likes to look for turkles in the morel patches, and we have found three this spring. Here's the turkle Chet found in our sideyard. We'd never had morels come up there before. What a thrill to find 15 of them raising proud heads in a neglected corner of the yard! 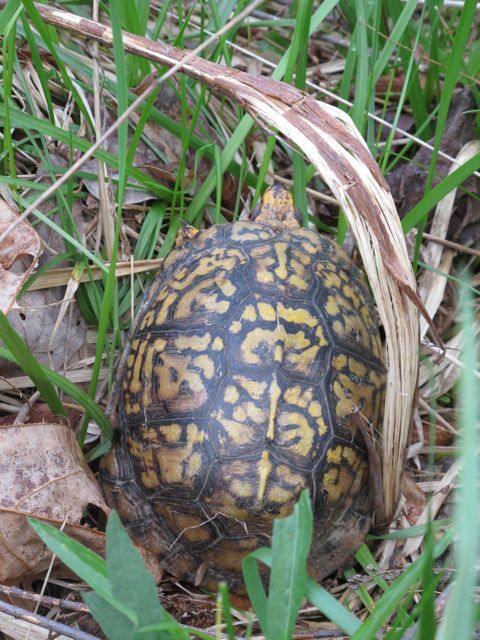 and the requisite Guardian Box Turtle to go along with them. Of course Chet is always on the lookout for squirtles and chiptymunks, too. 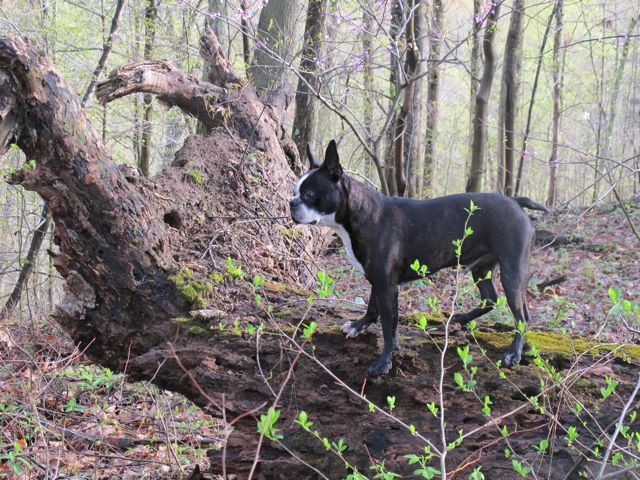 If there is a log, Chet Baker is on it, scanning the woods. 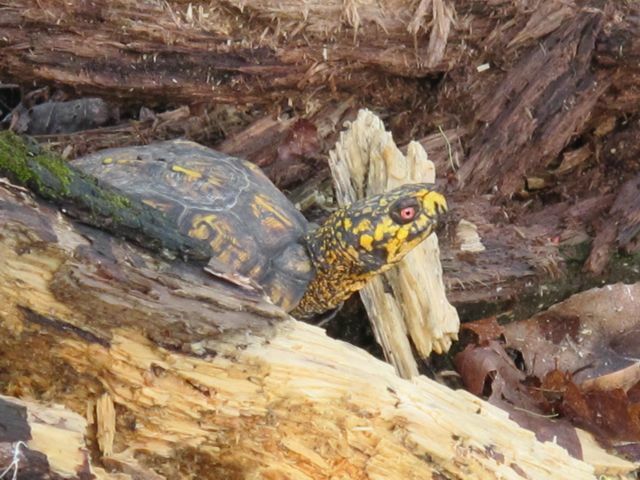 Bill spotted this gorgeous old gent just crossing a rotted log in a big patch of morels. This is not a coinkydink. 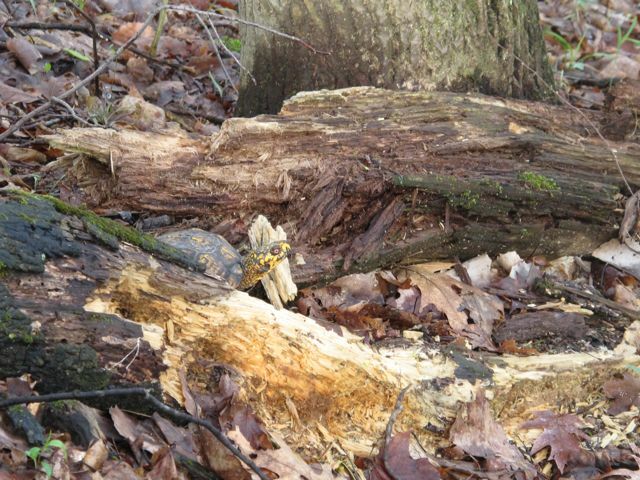 Here is a photo of turtle depredation on a half-free morel. Chunks are bitten out of cap and stem. We are never annoyed at this, nor have we ever considered taking action. 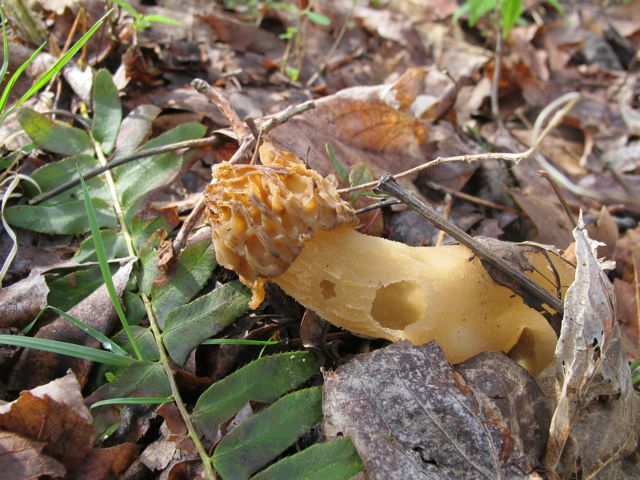 In fact, when we find turkles in our patches, we leave a morel in front of them as a gift to eat after we've gone. 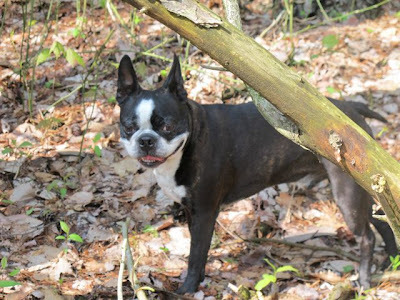 How wonderful it is to have both in our woods, and both at the same time. We only rarely pick turtles up when we find them. We watch them through binoculars and let them think we never saw them, then walk on. We treat them like Hollywood movie stars, play it cool; we don't run right up to them and gawk or ask them questions. Unless one seems to have a problem, and then it gets a full exam. Aftermath of a fine afternoon, prelude to a feast! Love these morel posts, Julie. Just wondering, though, where do beginners start to look for morels? The books say to start your search in oak or poplar woods, but you seem to have them popping up in your lawn! Do they like moist areas along streams? Or drier woodlands with lots of leaf litter? Or wood edges? Shelly, we really haven't found a huge correlation between overstory and morel occurrence, and now, as you point out, they are coming up in old field and lawn. This is supposedly the biggest year in recent memory for morels. Timing is the key. We find them here in so. Ohio in late April, as many of the warblers are coming in. And we're most successful in finding them higher up on rich slopes, not along streamsides. Your best bet would be to ask around until you find someone in your area who knows where and when to look. I always have difficulty advising folks on natural history things when I don't know where they live. Any good morel recipes you can share? Old order Mennonite Jean from New York state has written a post on my blog today. Its her first ever internet post, so please come by to welcome her, and ask her your questions. Thanks folks, i just wanted to share this with other bloggers. Thank you. Richard from Lebanons Amish commuity. I came home from work cranky and miserable. Then I read this post. Thank you so much for everything you and your family do and for sharing it with others. You make a difference in so many intangible ways. My day just got a whole lot better. It amazes me how much variation there is in regional box turtle species. Never thought this cat person would say it, but I've been DYING for a Chet Baker post, though I've loved all the other stuff too, don't get me wrong. 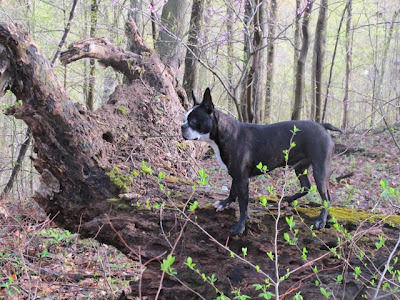 Julie, your posts stir many memories, including my childhood routine of morel hunting with my parents and siblings every Mother's Day afternoon - what we viewed as the beginning of morel season in northern Ohio - on our farm near Akron. Here in the Pacific Northwest, particularly in the Cascade Range and foothills, morel season has taken on a very different meaning recently. Morels are particularly prolific in areas that have suffered a forest fire, specifically in the first spring following the fire. The crop is so large, and so profitable, that armed groups vie for control of their 'territory' and can achieve significant financial gain in a short time. The Forest Service has been forced to start permitting and patrolling the most prolific areas to try and reduce the potential for armed conflict....such a strange contrast to the joyful family time I recall, and that you are still experiencing today. I wish more people would follow your example of leaving our wild friends alone unless they need nelp. When I tell people I have raccoons and opossums on my deck, they always want to tell me how to get rid of them. I tell them it's not likely they're going to leave, with bananas and peanut butter and boiled eggs being served nightly. That probably isn't a good thing either but they're sooo persuasive. Oops! That would be help, not nelp; should have previewed. Have you seen Naraht lately? OH-and I agree with Mary Jane re: why not just enjoy nature and leave it alone?